What are the 10 fatal mistakes traders make? Trading is exciting. Trading is hard. Trading is extremely hard. Some say that it takes more than 10,000 hours to master. Others believe that trading is the way to quick riches. They might be both wrong. What is important to know that no matter how experienced you are, mistakes will be part of the trading process. That’s why you should be prepared to expect them and if possible not make them. Easier said than done you would say and you will be completely right. That is why I have compiled that list of trading mistakes that you should be trying to avoid. Real life trading will show you how “easy” that could be. The first fatal trading mistake that traders make is trading with no plan. Having a written predefined trading plan will help you for two reasons. Trading depends on several aspects, which include the situation in the markets around the world, the status of overseas markets, the status of index futures such as Nasdaq 100 exchange-traded funds. Considering index futures is a wise option for evaluating the overall market conditions. Make a to-do list and build a habit of researching the market before calling your shots. This will not only keep you from taking unnecessary risks, but it will also minimize your chances of losing money. Over-leveraging is the second mistake of “what are the 10 fatal mistakes traders make”. Over-leveraging is a two-edged sword. In a winning-streak it could be your best friend, but when the trend changes, it becomes the greatest enemy. Recent talks about banning leverage higher than 1:50 for experienced and 1:25 for new traders in the UK have been a result of a lot of traders losing their money too fast. Whether it will happen next year or not is a matter of time for us to see. This is good news for most of the inexperienced traders, because it will somehow limit their exposure. It will allow them to follow their money management rules easier. For greedier and more impatient traders, this is terrible news. Fortunately, this might lead to a better result on their performance in the long term, as well. Over-leveraging is a dangerous way to believe you can make more money quicker. A lot of traders are mislead into this way of thinking and end up losing all their money in a short period of time. Some brokers are offering insane amounts of leverage (like 1:2000) that can lead to nothing more than oblivion. Therefore, one needs to be extremely careful when selecting those levels and the brokers that represent them. That’s why diversification among different brokers is probably the best strategy. Computer systems are more effective for the purpose of trading because they don’t have feelings about the things that go into the trading environment and they are neither emotionally attached to the factors that are in one way or the other related to trading. Moreover, computers are capable of doing more at a time as compared to mechanical traders. This is one of the several reasons that more than 50% of all trades that occur on the New York Stock Exchange are computer-program generated. A typical entry rule could be put in a sentence like this: “If signal A fires and there is a minimum target at least three times as great as my stop loss and we are at support, then buy X contracts or shares here.” Computers are more rational when it comes to taking quick decisions following a set of rules. No matter how experienced traders are, sometimes they tend to be hesitating at taking a decision no matter what their rules state. Normally, traders put 90% of their efforts in looking for buy signals, but they never pay attention to when to exit. At times, it is difficult to close a losing trade, but it is definitely wiser to take a small loss and continue looking for a new opportunity. Professional traders lose a lot of trades each day, but they manage their money and limit their loses, which leads to a profitable trading statement for them. Prior to entering a trade, you should be aware of your exits. There are at least two for every trade. First, where is your stop loss if the trade goes against you? This level must be written down. Mental stops don’t count. The second level is your profit target. Once you reach there, sell a portion of your trade and you can move your stop loss on the rest of your position to break even if you wish. As discussed above, never risk more than a set percentage of your portfolio on any trade. What are the 10 fatal mistakes traders make? Rule number 4 is patience. Patience in FOREX trading eventually pays off as it allows you to sit back a bit and wait for the right trading setup. Most traders are too eager to jump in and trade whenever any opportunity arises. This is probably due to our human nature and the eagerness to make a “quick buck”. But if there is one thing that ensures a high probability of winning, it is having the patience to grasp all the necessary information before you trade. This apparently will take time as there are many factors involved in it, such as the forming of trends, trend corrections, highs and lows. Impatience to look at these matters could result in loss of money. It could be helpful sometimes to take a break, allow oneself to have the time to look at the bigger picture, instead of focusing too much on one aspect. Remember that a single transaction might resonate in a series of future losses if executed at the wrong moment. It takes time and patience to wait for the market correction, before you commit to a trade. BUT IT TAKES TIME…Some traders fail to realize that to be successful will take time. They often fall prey to their own impatience in the hope of earning fast money. It could be a rough environment, and charts might be hard to read, so it is wise at times to step back in order to avoid costly mistakes. Don’t rush things out, or try to enter in a trade at all costs by just following your gut. The market could be quite tricky and often does send out the wrong signals. Wait patiently for the best opportunities to align themselves and then act mercilessly. “The trend is my friend“- another cliche sentence, which has helped me stay on the right side of the market for as long as I am a trader. If you think about trading the way I do, it could be a boring business, but at least one that makes money. I am not really interested in quick returns. I am not interested in penny stocks. I am not interested in the most popular trades that everyone is talking about. I like to do my own analysis. The more boring a trade looks, the better for me the trade is. Always consider the trend before placing the trade! Folk wi sdom says that if you throw a frog in a boiling water, it will promptly jump out of it. But if you put the frog in lukewarm water and then slowly heat the water, by the time the frog realizes that the water has become boiling, it will already be too late. Studies of decision making have proven that people are more likely to accept ethical lapses when they occur in several small steps than when they occur in one large leap. This statement also explains nicely the unfortunate process of unprofitable trading. Once you are in a losing position, you don’t realise if it slowly accumulates into a big loss. You have your own bias and it might lead you into obscurity. That is why one of the most important elements of successful trading is objectivity. It is also one of the hardest elements of mastering the field of trading. Inattentional blindness is definitely not helpful to the human psychology and when it comes to trading, it could be detrimental. Make sure that you close any unnecessary programs on your computer and reboot your computer before the day begins, this refreshes the cache and resident memory (RAM). Several trading systems allow you to set up the environment according to your needs, set it up in a way that allows for minimal distractions and help you keep an eye on each in and out, alongside. Keep in mind that a flaw in the trading system can be costly. Make sure you have a valid proof that your trading strategy does return positive results on a consistent basis. Do not rush into trading before that. Trading the markets is like stepping into a battlefield- you need to be emotionally and psychologically prepared before entering the field, otherwise, you are stepping into a war zone without a sword in your hand. Make sure you have checked three things before you start trading: 1)you are calm, 2)you had a good night’s sleep and 3) you are up for a challenge. Having a positive attitude towards trading is extremely crucial. If you are angry, preoccupied or hung-over then you are at a bigger risk of losing. Make sure you are completely relaxed before you step into the market, even if you have to take yoga classes, it is totally worth it. Rule number 9 of “What are the 10 fatal mistakes traders make” list is money management. Risking between 1% to 2% of your portfolio on a single trade is the best way to go. Even if you lose while betting on that amount you will be capable enough to trade some other day and make up for your loses. The amount of risk a trader can take is the amount he thinks he will be able to get back the next day. It is a wise option of start with a smaller amount and slowly and gradually increase the percentage. You can come back to point number 2 “Over-leveraging” and read it again. Having the right money management skills is probably one of the most important traits of the profitable trader. And of course- it is one of the most common mistakes amongst the losing traders. Keeping records is a key to being successful at trading. If you win a trade, you should note down the efforts and the reasons that pulled you towards the trade. 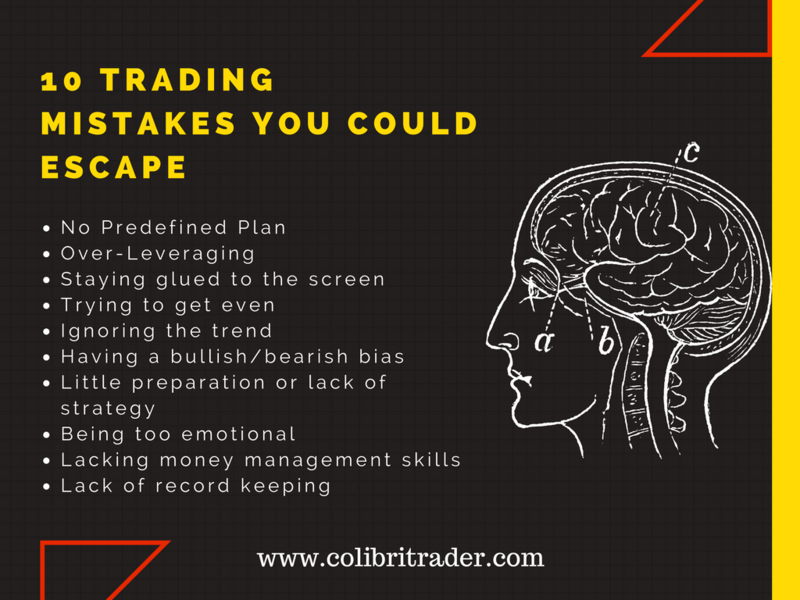 If you lose a trade, you should keep a record of why that happened in order to avoid making the same mistakes in the future. Note down details such as targets, the exit and entry of each trade, the time, support and resistance levels, daily opening range, market open and close for the day and record comments about why you made the trade and lessons learned. You should save your trading records so that you can go back and analyse the profit or loss for a particular system, draw-downs (which are amounts lost per trade using a trading system), average time per trade (in order to calculate trade efficiency) and other important factors. Remember, this is a serious business and you are the accountant. What are the 10 fatal mistakes traders make?? Successful paper trading does not ensure that you will have success when you start trading real money and emotions come into play. Successful paper trading does give the trader confidence that the system they are going to use actually works. Deciding on a system is less important than gaining enough skills so that you are able to make trades without second guessing or doubting the decision. There is no way to guarantee that a trade will return profits. This is the actual beauty of trading and being consistent is based on a trader’s skill set and his/her eagerness to improve. Keep in mind winning without losing does not exist in the world of trading. Professional traders know that the odds are in their favour before entering a trade. It is a continuous process of making more profits and cutting down loses which might not ensure a win every time, but it wins the war. Traders or investors who don’t believe in this adage are more viable to making loses. Traders who win consistently treat trading as a business. While it’s not a guarantee that you will make money, having a plan is crucial if you want to become consistently successful and survive in the trading battle. 112.081 the reason I exited was the one hour group candle formation. During these 4 hours of each one hour candle I found it agonizing to hold my long so I closed my position but at same time I opened a buy stop above 112.22 in case of trend continuation. Now that price has revealed itself it looks as though it was the correct thing to do. In closing my question is: is it correct to sell a position if unsure then open a buy stop if you’re in a long to then capture trend continuation ? In case you are not seeing a selling setup (PA) on a Daily timeframe, then the lower timeframes should not be an issue. Sometimes, the price might return to your initial entry, but that is part of the game. I know you want to lock profits like everyone else (human nature), but sometimes you need to be a bit more patient and wait for the long-term. Maybe you would like to answer yourself an essential question: “Do I want to be a long-term trader or a short-term trader?”. Ponder over that for a while and try to find the answer for yourself. that 111.897 to 112.081 was a resistance zone I had on chart. I was looking for what p/a would do around there. As a side not my entry was a bit late. I sincerely appreciate your reply, I have learned some thing yet again about the game and myself. It is a constant process of learning, Dan! “It is a constant process of learning” It certainly is … I welcome the constant learning. This might not be the right place to comment more on your USD/JPY analysis. During my weekend research I found that money can flow into it USD/JPY during times of macro uncertainty. According to the weeky for this pair a flag pattern is forming. One with a significant MMove if this breaks. I wonder how relaible this pattern can be % wise. Last daily candle is an inside one, I will wait to see how this breaks, could be a precursor to a bearish market event. I usually do not trade chart patterns. I might write an article about them at some point, but that does not mean that I will use the formations for my trading. What I am looking for are pivot areas, price action and money management. Otherwise, money can flow in other assets in times of macro uncertainty- could be Gold, Silver or other assets depending on the market environment. With regard to your approach, pivots areas, price action and money management. I want to stress … not looking to trade this pair just appreciating your replies and applying myself for a better understanding of your approach. Helpful reply thanks, I did take and study your course and my post relates to your mention of “pivot areas” but I realise it’s another term for support or resistance areas/zones. I should have realised but wanted confirmation incase it was a nother angle of your approach. Apologies sometimes I can complicate things. I wanted to add that your approach is so straight forward, that in the beginning I wondered if prop firms actually trade this way. As a retail trader I thought it was much more complex as these businesses have access to more advanced tools than I.
I fully realise after backtesting and viewing charts that in fact it is the safest most efficient way to trade. I will add that although simple approach can be extremely difficult to hold but thats what separates the amateurs from the pro’s. I’m watching the USD/JPY aroound 110.39 this is an area of interest because from some reason there was strong buying there round Mar 28th. Just waiting for signals IE: bull engulf or inside bar anything bearish rejecting. Need to wait for real confirmation. The next observation although 8 hours in hindsight is GOLD. “A perfect entry” after a retrace @ 1246.23 area. (4hr TF) This was “colibri textbook” not too happy I missed it. I’m also looking at GPB/USD it’s not a screaming long signal but my eyes are drawn to current p/a on 4 hr support has been respected with inside bars happening it looks like a low risk long atm. Thanks for the comments! You are actually partially right abut prop firms- some of them are really using quite complicated strategies. Some are market making, others are using altos, still others are using market profile/reading the tape/using the ladder approach… the ways are numerous, but in the end what matters is whether a certain approach makes money. So, if a certain approach is profitable, there is nothing wrong with it in my opinion. Regarding the EURJPY- it has not shown any price action confirmation yet around the pivot (support) level. It is still not too late, but I am still not seeing any sign of hesitation. Regarding USDJPY, I will be looking around or below the 110.00 level. A lot of times price dips just below the imminent support or resistance area before turning direction. I agree about Gold, but also consider the imminent resistance area at 1265. Regarding GBPUSD- there could be a small intraday pattern on 4H, but again, it is better to start with Daily and then skim down. But still, there might be a potential for a 100-150 pips there.